Wonderful floral and citrus hop notes sing on the palate, balanced by a warm, sweet malt finish. With this range, the hard work is done for you, so you can make delicious world class beers without fear of failure. 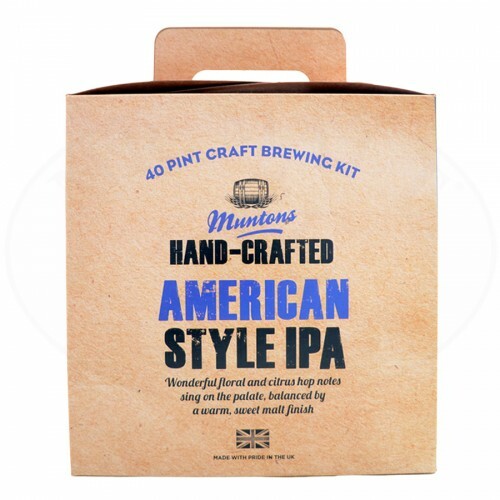 Every beer style in the range has been carefully formulated with its own unique and specific ingredients, expertly blended by Muntons, to allow you to easily recreate authentic craft beer of outstanding quality. The brewing process has purposely been kept ultra-simple, so that you can enjoy both the making as well as the drinking of these very special modern-classic ales. 40 pint beer kit, sufficient for 23 litres of beer. Ingredients: Hopped malt extract (BARLEY malt, water, hop extract), hop, dried yeast; the product may contain traces of WHEAT, RYE, OAT Components of the kit:4.